Puerto Vallarta Mexico... If I had to award a prize to the most beautiful beach resort destination in Mexico . . . Puerto Vallarta would win. No contest. It all started with a quiet fishing and farming town where the wealthy in the know would go to escape in the 1950's. Then came "The Night of the Iguana" . . . a popular movie by Director John Huston with Richard Burton, Ava Gardner and Deborah Kerr (released in 1964). -- Tourism boomed and a world class vacation destination began to take shape. Puerto Vallarta has managed to strike a fine balance between ocean side hotels and the authentic charm or ambiance which gave rise to the hotels in the first place. Yes . . . there are hotels which line the beach . . . but they have done an excellent job of merging themselves into the city which was there before them. The beach may be lined with hotels, but the hotels are nestled snugly between the cobble stone streets, palapas, cafes, restaurants and shops which nicely integrates the new into the old. The exception to this is Nuevo Vallarta. Nice new resorts which are visiting distance from Puerto Vallarta . . . but I have to recommend staying in Puerto Vallarta proper. There are plenty of nice hotel rooms near the city center and if you have a choice, being able to step outside your hotel and walk down cobble stone streets to a Mexican cafe, restaurant or the beach really make a huge difference in your experience. It's not the facilities . . . it is the flavor of the facilities near the center of Puerto Vallarta. Other than the well integrated hotels that have become part of Puerto Vallarta's charm, the list of things to see and do goes on and on. You will find jungle tours, swim with the dolphin tours, submarine tours, mountain tours, booze cruises, dive shops, clubs, bars, shopping, see where the movie "Night of the Iguana" was shot, where Predator was shot. . . and on and on and on. Best of all, if you click on the hotel link above, you will find that there are some very economical hotels near the city center that start at around $65 USD! -- The hotel Emperador is one of these with a great location right on the beach and walking distance to everything in the center of Puerto Vallarta. Puerto Vallarta has become a popular tourist destination and many people decide that they want to spend more time in the area. 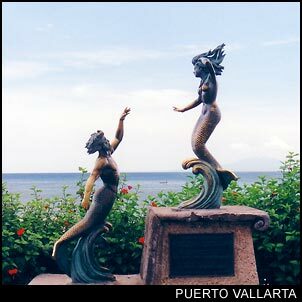 There is a growing expat community of Americans, Canadians and Europeons that have retired or moved to Puerto Vallarta. Vacation homes for rent, beach front condos as well as other types of property have become more popular over the last decade. It is important to do your research when buying a place as there are some legal issues that you must fully understand before getting involved in any transaction.